FREE invitation to everyone to get together with family and participate in the seminar – Registration required & Dinner included. 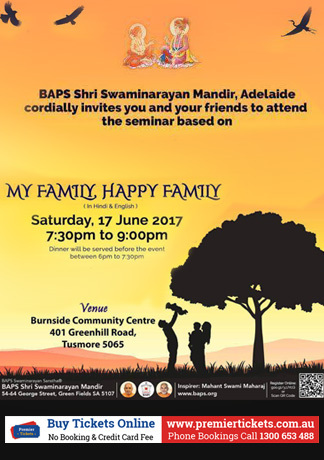 BAPS Shri Swaminarayan Mandir, Adelaide cordially invites you and your friends to attend the seminar based on My Family Happy Family (In Hindi & English). Everyone is welcome to join, irrespective of their background, color, caste or religion.